Do you have a niche? A niche is a small slice of your industry in which you are considered a subject matter expert. When people talk about your niche, they think of you. When someone has a problem that needs to be solved in your niche, you are the go-to person for solutions. Your niche is the place that you can make a large impact based on your skill set and experience. If you had to pick a niche, what would it be? What big problem am I solving and who am I solving it for? In my recent Tech Savvy Women TV video, I talk about the value and importance of finding and marketing your personal niche. 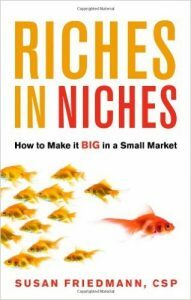 In the video, I refer to the book Riches in Niches by Susan Friedman. Towards the end of her book, she talks about the pros and cons (actually she calls them the “pleasures” and “perils”) of being a Niche-preneur. When people think of you, what do they think of? For what are you known? If that isn’t clear right now, discovering and nurturing your niche should be a priority as you seek to advance in your career.